The St. Johns River Water Management District uses prescribed fire to reduce the possibility of dangerous wildfire while enhancing land’s environmental quality. 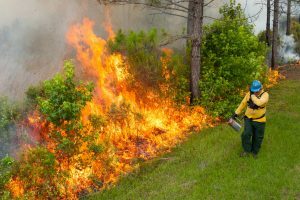 MAITLAND, Fla., Feb. 7, 2019 — The St. Johns River Water Management District is conducting a 483-acre prescribed burn on the northeastern portion of Hal Scott Regional Preserve and Park in Orange County. The purpose of the burn is to reduce hazardous fuel accumulations, improve habitat for listed species and the maintenance of fire-dependent ecosystems.